There was a man who was known for being a ruthless and relentless dictator. That man was known as Saddam Hussein. Many people know the name; they know that he was somehow involved in Iraq and they know that at one time he was a man under intense scrutiny for weapons of mass destruction in his possession. Yet, that is where the details tend to grow a little fuzzier in most people’s minds. Saddam’s name is often used in conjunction with names such as Osama bin Laden, the Taliban, Al Qaeda and chaos in the Middle East. Who Was this man and what did he do? Saddam Hussein was a dictator in Iraq. Well, he went by the name of President and insisted that he was a fairly elected leader. It is important to take note that his reign was considered to be one of the most brutal reigns in Iraqi history. For over 30 years, Saddam Hussein ruled over Iraq with an iron fist. His policies were that of sheer brutality. There was no room for human rights in Saddam’s reign, there was only room for Saddam’s own ego. Over the course of his time, Saddam was responsible for strengthening his political party, the Ba’ath by only allowing them to run and participate in the political process. The Ba’ath were only 8% of the nation, yet they were 100% in charge of the political system. If there was dissent, Saddam would crush it. For those who disagreed with his own Islamic religious beliefs, he would destroy their holy signs. Islam is home to many different schools of thoughts and beliefs; not all Muslims believe the same, there are many different groups and factions within Islam. Saddam did not have mutual respect for those other parties that differed from his own and made the decision to suppress, destroy, and execute those who disagreed with his political and religious philosophies. His death toll was incredibly high. It has been estimated by human rights advocates that nearly 250,000 Iraqis were executed due to Saddam’s brutal regime. The man was a genocidist as does well as a tyrant, for in 1983, Saddam Hussein authorized the use of chemical weapons against the Kurdish people. The Kurds had been involved in an uprising to break out of the Iraqi control. Saddam did not tolerate their campaign and made the order to utilize deadly chemical weapons on the Kurds. But the chemical attack had not targeted armed militants, it had targeted in the city of Halabaj. Over 10,000 people, mostly innocents, were completely slaughtered by the chemical attacks. Such brutality showed Saddam’s lack of humanity, and his lack of common decency. This, to this day, remains as the single largest use of chemical weapons against a civilian population. Saddam Hussein was incredibly vain and egotistical as well. He firmly made certain that his image was everywhere, putting thousands of images of himself all over Iraq for the people to see and revere. One such propaganda piece was statues of himself that he had placed all over Iraq. Later on, these statues would be toppled in the Iraq war. He was a man who preferred to be seen as anything people wanted to see. To those who from the West, his suits showed that he had a Western sensibility about him. To those who wanted to see him as a local, he made certain that enough images of him in traditional Muslim garb were seen. His vanity and ego was unrivaled. The highlight of Saddam’s vanity can be seen in the elections that he would allow. Saddam would have elections for president, and the curious thing about these elections is that there was always 100% turnout. Not only did everyone show up to vote, they all would vote only for Saddam. That’s right, in Iraq, Saddam was the only president with a 100% approval rating and 100% election rating. Saddam’s brutality did not simply stay within his own country either. In 1990, he made the decision to invade Kuwait. This action to invade Kuwait was motivated by his desire to seize control of their assets, including oilfields that were nearby. He seized Kuwait and declared Kuwait to no longer be its own independent nation, it was to be the 13th principality of Iraq. This caused international conflict across the board and he was swiftly condemned by North America and her allies. Saudi Arabia, worried that Saddam Hussein would come after them next, enlisted the help of the United States to fight back. This started a military conflict that was known as Desert Storm. Desert Storm was a short war, lasting only from 1990 to 1991 with the United States making concentrated efforts to attack and liberate Kuwait. An extensive bombing campaign precipitated their invasion and with boots on the ground, the military action didn’t last terribly long. Eventually the United States was successful in liberating Kuwait, but Saddam Hussein was not deposed. After Desert Storm, relationships between Saddam and the United States were tense. The liberation of Kuwait had caused a new level of energy to seize the people who were being oppressed by Saddam and they began actively working against his regime. This only intensified Saddam’s grip on the country. Despite the United States encouragement for the Iraqis to overthrow Saddam, it was apparent that Saddam was still well in control. The man had delusions of grandeur, he believed that he was destined by God to be the leader of Iraq forever. Those delusions were threatened when the United States encountered September 11, 2001. On the fateful day of 9/11, America was attacked by radical terrorists from Al Qaeda. This terrorist attack led to an increased desire for security in the United States, and they began to question of what Saddam Hussein’s military capabilities were. It had been believed that Saddam possessed weapons of mass destruction. This became a hot button amongst all of the Western world. The United Nations demanded access to Saddam Hussein in order to see the weapons of mass destruction. The United States made a push for aggression, stating that they believed that Saddam had the capability for chemical and nuclear attacks that could cause serious damage to the free world. In a post 9/11 society, the last thing anyone wanted to deal with was an unstable dictator with control of serious weapons. The terrorist attack on the Twin Towers had left the world feeling vulnerable and devastated; the idea of Saddam Hussein supporting terrorists or even engaging in terrorism on a national or international level caused for the Bush administration to begin to focus on disarming him. So, the United Nations gave Saddam an ultimatum: allow us to inspect you or face consequences. Saddam opened up his doors and allowed for inspectors to check for weapons of mass destruction. Nothing was found. Regardless of this fact, the narrative that Saddam was in the middle of trying to obtain high powered weapons that could be used on a massive scale became the narrative within the United States of America. President Bush repeatedly made the case for moving in and forcing the Iraqi government to disarm. In 2003, the decision was made and Congress voted to go to war in Iraq. The stated objective was to forcibly disarm and overthrow Saddam Hussein’s rule. Essentially the United States had made the decision to invade Iraq and replace the regime with a democratic regime. Saddam Hussein was not swayed by their attack. The decision to invade Iraq to him was nothing more than defiance against his own supremacy. He tried to stand defiant, even as tanks rolled into Baghdad. Iraq was quickly overtaken and Saddam Hussein vanished for time. Eight months passed as Saddam went into exile trying to evade capture at all costs. Yet he was captured eight months after the invasion of Iraq had been started. He was captured in what was known as Operation Red Dawn. Operation Red Dawn, named after the film by the way, consisted of a military team that was searching for him in a farmhouse area near the small town of ad-Dawr. Where was this powerful, brutal dictator found? Hiding in the hole in the ground, camouflaged. Pulled from his spider hole, Saddam Hussein, the Butcher of Baghdad was found disgraced, covered in dirt, ragged and prepared to negotiate for his life. There would be no negotiation for Saddam Hussein’s life, however. For a man of such cruelty and brutality, he would only face a trial in the interim government that had been established by the Iraqi courts. So much so was his delusion that when he was referred to as the former president by an Iraqi judge, he was quick to correct the judge stating that he is the current president. Saddam Hussein believed that he was immune to prosecution because the laws stated that he was immune to being put to trial. Regardless of his own beliefs, the trials would continue forward. A tribunal had been put together to oversee the judgment of Saddam Hussein. He was brought up by the Iraqi people for many different crimes. His crimes against humanity included things such as the actions against the Kurdish people. It was believed that had participated in genocide due to the fact that during his reign he had eliminated between 50,000 to 100,000 Kurds. Such brutality warranted the death penalty. And so, the trials began. Saddam had not been a repentant man, even in the throes of facing his own execution. The diplomats and political allies who had visited him in prison were quick to hear that he had no remorse for his choices. He greatly believed that he had been doing the right thing and was even so far as to brag about his influence and control. He had been extremely hostile in court. Constantly getting into argument with the judges, refusing to recognize the authority of the court and consistently arguing for his own sovereignty, Saddam Hussein more or less was convinced that he did not need to defend himself for his actions. Ultimately he was charged in the death of 148 Shiites that had occurred very early on in his career. He maintained his innocence, he maintained that he did nothing wrong and he also maintained that he was the rightful leader of Iraq. He tried to argue that the court was rigged, that Bush was the main prosecutor of this court and that this was nothing more than America’s way of getting control over the Iraqi people. Regardless of what Saddam Hussein had to say about the matter, however, a consensus was reached on November 5, 2006. The consensus was that Saddam Hussein was guilty of crimes against humanity and was to be sentenced to death by hanging. International response to this sentencing was muddled at best. Most other countries oppose the death penalty, and would not make an exception for such an action against even the most brutal of men. Other countries believe that it was just. There was a concern as to legality of the court doing such a thing, and human rights groups question whether it was truly of unbiased court decision. Regardless of international reaction, Saddam Hussein was brought in for execution on December 30, 2006. 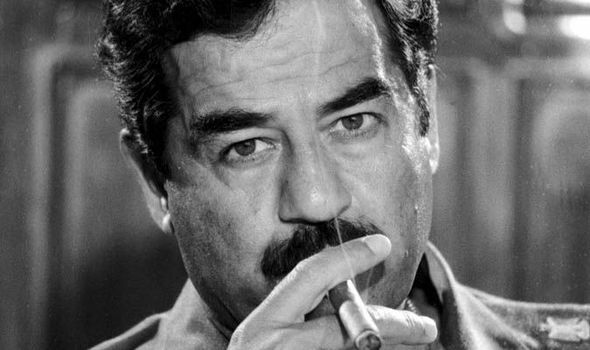 There are many different reports on Saddam Hussein’s behavior on the day of his death. Some say that he was fearless and defiant to the end, others say that he was a broken and sad man. The reality is that there was no dignity in his death. The crowd was hostile to him and he was just as hostile back. When taunted, he would taunt back. When mocked, he would mock as well. Any semblance of a strong, kempt leader had vanished in those final hours. In the early morning, they brought him to the platform where he was sentenced to die. With rope around his neck, he began to boldly call for resistance to American influence and for the triumph of the Muslim State. He had refused to wear a hood, choosing instead to use his last moments uttering his prayers. In a swift motion, the platform beneath his feet opened and the long, brutal reign of Saddam Hussein ended forever.